David Miller & Associates, Inc.
DMA managed and prepared the Section 203 (WRDA 86) and 204 Studies for navigation improvements (channel widening and deepening) at Port Canaveral, Florida, leading to completion of construction in 2016. Port improvements were intended to serve the larger cruise ships and bulk cargo vessels calling at the Port now and in the future. The Project began as a Section 203 Study, which received a positive recommendation to Congress and authorization in WRRDA 2014. The immediate needs of the CPA required DMA to assist the CPA in reconfiguring the study as a Section 204 (f) project, which was approved by the USACE and constructed by Port Canaveral at non-Federal expense. The Assistant Secretary of the Army agreed to Federal assumption of maintenance of the completed project. DMA’s roles were Project Management, Plan Formulation, Feasibility Report Preparation, and NED Benefit/Cost Analysis, and Public Involvement. Project management tasks performed by DMA included: identification and coordination of all necessary engineering, environmental, planning, and economic studies needed to meet USACE's requirements for a feasibility study. Economic analysis tasks performed by DMA included: commodity and cruise projections, fleet forecasts, and calculation of with and without project transportation costs. Plan formulation tasks included: development of without and with project conditions, formulation of alternatives, evaluation of alternative plans, and identification of the NED Plan. DMA also provided Port Canaveral with Corps policy compliance advice and assistance, and assisted the Port in conducting coordination with the Jacksonville District and Headquarters of USACE. Our firm responded to Coprs of Engineers Agency Technical Review comments, prepared the presensation of District Engineer's briefing, prepared Civil Works Review Board conference briefing packages, and provided support to Port Canaveral during the Civil Works Review Board process. In addition, DMA assisted with the planning and conducting of public meetings and resource agency meetings. DMA performed the economic reanalysis of the New York and New Jersey Harbor Navigation deepening project as part of the Limited Reevaluation Report. The 50+ foot deepening of the Federal channels in New York/New Jersey harbor is one of the largest commercial navigation projects in the nation. Since DMA completed its feasibility phase effort in 2000 (see below), significant changes occurred at the Port of New York and New Jersey, most notably a much higher than anticipated increase in container import volumes. The reanalysis effort was conducted to account for this significant increase in waterborne commerce, as well as reductions in project costs since the time of the feasibility study. DMA updated commodity forecasts, and fleet projections, reassessing landside throughput capacity, conducting a market share analysis, reevaluating future without project conditions, and computing project benefits and costs. DMA has unmatched experience in conducting plan formulation, environmental and economic analyses of deep draft navigation projects throughout the nation, both for our Port clients and for the U.S. Army Corps of Engineers. The purpose of DMA’s investigations is to determine the feasibility of major port improvement projects and to prepare the decision documents necessary to authorize and implement project construction. The Federal interest in navigation is derived from the Commerce Clause of the Constitution and is limited to improvements in the navigable waters of the U.S. which are of general public interest and open to use by all on equal terms. Navigation improvements include: channels, jetties and breakwaters, locks and dams, basins or water areas for vessel maneuvering, such as turning basins, anchorages, mooring areas, etc., removal of wrecks and obstructions, snagging and clearing, drift and debris removal, and bridge replacements or modifications (when necessary to remove obstructions to navigation). Increasing these commercial navigation projects are also being pursued by non-Federal interests under authorities provided by Congress for them to do so. DMA works for both Federal and non-Federal clients in the conducting the planning and leading the approval processes for these projects. DMA is conducting an economic analysis for the Sabine Neches Waterway Deepening Project, TX. The goal of the analysis is to determine whether continued maintenance dredging generates a significant benefit for the Navigation District. In support of the District, DMA will provide two major services, Benefit-Cost Analysis Support and Project Development Process Advisory Services. The Benefit-Cost Analysis Support services involve data gathering, economic analysis, and discussions and interactions with the Corps of Engineers on the benefit/cost reanalysis of the current Sabine-Neches Waterway Channel Improvement Project. Specific analytical services that will be provided by DMA include Service Projections, Vessel Characteristics and Operations, Alternative Port Characteristics, Cargo Characteristics and Volume, Coordination with the Galveston District and Deep Draft Navigation Center of Expertise, Transport Cost Calculations, Benefit Cost Reanalysis of USACE analysis, and review of Economics Appendix and reviews previously conducted by the USACE. For Project Development Process Advisory Services, DMA will advise the Navigation District on the various methods and processes available to them for non-Federal involvement in the project’s implementation. Specific services may include advisory services concerning: financing, funding, and implementation of the project using standard Civil Works Project Development Process; potential for conversion to a Section 204 (WRDA 1986 project as modified by Section 1014 of WRRDA 2014);. For the Virginia Port Authority, DMA is preparing an EIS for the Elizabeth River Navigation Channel Deepneing as directed by the Council on Environmental Quality NEPA- Implementing Regulations (40 CFR 1500-1508) and USACE Engineering Regulation ER 200-2-2. While this contract is in its early stages, numerous tasks have been completed including preparation of an internal scoping/ preliminary planning document to summarize the critical assumptions that will frame the draft EIS; formation of agency coordination letters, preparation of a draft NOI in accodrance with the Council on Environmental Quality's NEPA Implementing Regulations (40 CFR 1500-1508) and Engineering Regulation ER 200-2-2; and administrative and technical support for a public scoping meeting. As the project progresses, David Miller & Associates, Inc. will be responsible for the following tasks: informal Scoping with the Resource Agencies, preparation of the Draft EIS (including Review of Existing Studies, Data, and Documents, prepration of a Construction Assumptions Appendix, quantification and articulation of the direct and indirect effects of the tentatively selected plan); particiaption in Public Hearing, and Review, Categorization, and Reponse to Comments on the DEIS; preparation of the Preliminary Draft and Final Draft Records of Decision; and preparation and transfer of the Administrative Record. For the Oregon International Port of Coos Bay (OIPCB), DMA is working in conjunction with several other firms, including David Evans and Associates and Moffatt Nichol Engineers to support the Feasibility Study and Environmental Impact Statement for navigation improvements at the Port of Coos Bay​​​​​​. DMA will assist the OIPCB study team to bring the Feasibility Study and Environmental Impact Statement through completion of the Corps of Engineers' Civil Works Review Board and will assist in taking the Section 204 (f) Project from completion of the CWRB through completion of the Chief of Engineers Report, ASA, and OMB reviews. Finally, DMA will assist with the transmission of the completed Feasibility Report by ASA to Congress. Specifically, DMA is providing project management support services in the implementation of USACE Section 204 (f) Project Development Process, including project scheduling and preparation of management coordination, letters, meetings, and support. DMA will review all existing project documentation for inclusion in the Feasibility Report and Draft EIS, including all plan formulation, engineering, economic, and environmental documentation, to identify any data or analytical gaps and potential USACE policy implications. Our firm will review all existing economic analysis conducted for the Section 204 (f) Study, utilize that material in the performance of the economic analysis, and supplement existing data and analyses as required to support identification of the NED plan and plan selection. This includes conducting a Port Facilities Analysis, developing a Trade Forecast, conducting a Market Share Analysis, developing a Fleet Forecast, developing with and without project future conditions and calculating with and without project transportation costs, calculating NED benefits and costs and identifying the NED plan, conducting risk and uncertainty analyses, and producing the pre-draft, draft, and final Economic Appendices and Quality Control Report. DMA will perform the Section 204 (f) Plan Formulation Analyses including identifying and performing analyses of problems, opportunities, and constraints; identification of existing and future without project conditions; formulation of measures and alternative plans; development and preliminary screening of alternatives; evaluation of alternatives; comparisons of alternatives; and NED plan identification and plan selection. Finally, our firm will draft the Section 204 (f) Study Report, revise the report in response to USACE PGM comments and prepare the comment/response document to agency and public comments, prepare the final Section 204 (f) Study Report, and follow the project through the Civil Works Review Board. 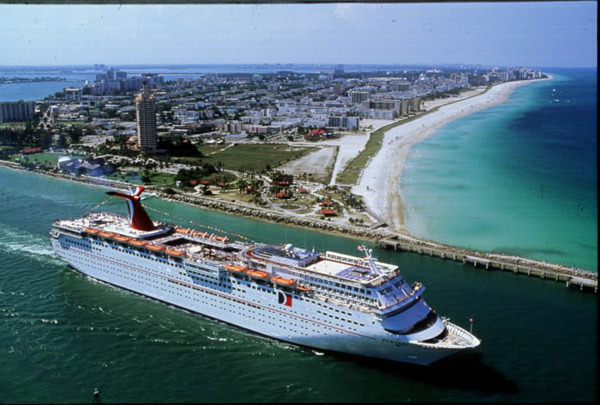 The Port Canaveral 21st Century Section 203/204 (WRRDA 2014) project is the next phase of navigation improvements being considered by the Canaveral Port Authority (CPA). The 21st Century Project builds upon the recently constructed Section 204(f) Deep Draft Navigation Project (also referred to as the 44 Foot Project). The 21st Century project will evaluate further deepening and widening of the main shipping channel and turning basins, up to a maximum depth of 48/49 feet. The goal of the 21st Century project is to evaluate further navigation improvements needed in order to accommodate larger vessels and to meet the demands of the port and its users into the new century. The Canaveral Port Authority has again retained the services of DMA to lead a team of consultants to perform the required technical investigations in support of the Section 203 / 204 Feasibility Study. Upon completion of the feasibility phase investigations by DMA, the Port will determine whether it wishes to pursue the project under either the Section 203 or Section 204(f) project authority. DMA prepared the Project Management Plan for the project, identifying the technical investigations, cost and schedule necessary to complete the feasibility phase of the project. In the current feasibility phase, DMA is both managing and preparing technical components of the Section 203 / 204 Study. DMA is responsible for three major technical components of the 21st Century project, which include 1: Project Management Support Services, 2: Economic Studies, and 3: Plan Formulation and Streamlined Feasibility Report. Project Management Support Services, includes: developing, maintaining, and updating the project schedule; coordinating consulting team activities with the CPA, USACE, and other regulatory agencies; holding project meetings, managing the Quality Management Program and developing a Quality Control Plan that includes periodic internal and external agency reviews. Economic Studies includes providing: Commodity Projections, Distribution Center Analysis, Cargo Origin Destination Mapping, Landside Transportation Analysis, Future Scenario models, correlations of the depth and width of the port to NED benefits, Funding Strategies, Regional Economic Benefit Analysis, and an Economic Appendix and Quality Control Report. Plan Formulation and Streamlining Feasibility Report services include the following. DMA will develop plan formulation parameters, establish with-out project conditions, screen and evaluate alternatives, coordinate plan formulation with the USACE, create a dredge material management plan, and draft and complete section 204 Study and environmental reports. For the Savannah Harbor and Channels, DMA is conducting an economic analysis of annual maintenance dredging of the Federal channel at Savannah Harbor. The goal of the project is to provide the clients with an accurate estimate of the potential reduction in net NED benefits as a result of deferred or inadequate maintenance dredging. The services provided will include: collecting relevant vessel and cargo data, calculating total transportation costs as a result of the limited depth of the channel, comparing transportation costs with different harbor depths, and producing a final report to present the to USACE and the client. DMA is assisting the North Carolina State Ports Authority (NCSPA) in conducting a feasibility study of potential navigation improvements at the Port of Wilmington, NC. The feasibility study and resulting project will be carried out under the authority granted by Section 203 of WRDA 1986, as amended by Section 1014 (a) of the Water Resources Reform and Development Act (WRRDA) of 2014, and Section 1126 of the Water Infrastructure Improvements for the Nation (WIIN) Act of 2016. These federal laws provide the Congressional authorization for a non-federal entity to perform the necessary investigations and submit the completed feasibility study to the Assistant Secretary of the Army (Civil Works) (ASA(CW)) for review and potential recommendation to Congress for project authorization. Congressional authorization of the Section 203 Study would be followed by Congressional appropriation of the federal share of design and construction funds. DMA is managing the Section 203 Study on behalf of the NCSPA, and providing plan formulation, decision document preparation, economic analysis, and project management services, leading the efforts of a multi-firm team of engineers and environmental scientists. The team is performing all of the technical investigations, public and agency coordination, and report preparation services necessary to complete the three-year Feasibility Study as if it were being performed directly by the Corps of Engineers. This study will greatly increase the likelihood of the Port of Wilmington navigation channels being improved in a timely fashion to meet the changing needs of the maritime industry for deeper and wider channels to take advantage of the efficiency gains provided by the newest generation of deep draft ships. Economic analysis is being conducted by DMA to determine the NED benefits associated with the proposed navigation improvements. Plan formulation activities are evaluating channel deepening and turning basin improvements in an incremental analysis framework. The Section 203 Report will be prepared by DMA to mimic a feasibility report prepared by the Corps of Engineers. And finally, DMA is managing a multi-firm team comprising all of the engineering and environmental expertise necessary to prepare a fully compliant feasibility report for eventual submittal to Congress by the ASA(CW). DMA conducted plan formulation activities, prepared the Alternative Formulation Briefing Package, Without Project Conditions Report, and the General Reevaluation Report (GRR) for the deepening study at Savannah Harbor. The original Feasibility Report for Savannah Harbor was prepared by the Georgia Ports Authority under the auspices of Section 203 (WRDA 86). The Feasibility Report lacked certain critical elements required by Corps policy, resulting in a contingent authorization by Congress and necessitating preparation of a GRR to complete required plan formulation and environmental activities. Technical engineering, environmental and economic portions of the GRR were prepared by a multi-District team, including members of the Savannah, Wilmington, and Mobile Districts. DMA is the Corps’ principal plan formulation contractor, tasked with conducting all plan formulation activities and preparation of the GRR, with input provided from the various Corps District project development team members. DMA conducted the screening and evaluation of alternatives, analysis of the system of accounts, preparation of the AFB documentation, coordination with the non-Federal sponsor, and preparation of the GRR. The Virginia Port authority has hired DMA to plan and manage project studies, conduct an economic analysis of the cost/benefit of deepening the harbor, and advise the Port on the GRR (ER 1105-2-100) with respect to the work performed by the USACE. Project Management tasks to be performed by DMA fall under two broad categories: schedule development, tracking, and revisions; and contract and sub-contract management. DMA will develop and monitor study schedules, as well as regularly report on the schedule’s progress. DMA will also provide oversight and manage all subcontractors. Working jointly with the VPA and NAO, DMA will oversee Public Outreach, Data and information gathering, PDT Coordination, SMART Planning Milestone Support, Development and Decision Management Plan and Rick Register, Develop existing and future without-project conditions, Plan formulation, Evaluation and Selection, and Feasibility Report Preparation. Collaborating with the DDNPCX, DMA will collect, evaluate, and formulate existing data for use in economic analyses, conduct vessel operations analysis, conduct and document interviews with industry personnel; advise the Port on HarborSym Model development and calibration and on Economics Appendix production, review and comment on Commodity Forecasts, and subcontract the Fleet Forecasts to MSI. ​​​​​A partial list of DMA commercial navigation project studies for its non-Federal and Federal clients include the following major ports around the nation: Boston Harbor, the Port of New York and New Jersey, Delaware River, the Port of Baltimore, Norfolk Harbor and Channels / Hampton Roads, VA, Wilmington Harbor, NC., the Port of Charleston, SC, Savannah Harbor, GA, Port Canaveral, FL, Port Everglades, FL., Tampa Bay / Big Bend Channel, FL, Port Manatee, FL, Hillsboro Inlet, FL, Sabine – Neches Waterway, TX, Port of San Francisco, CA, Port of Coos Bay, OR. DMA conducted the economic analysis for a Limited Reevaluation Report to analyze the potential transportation cost savings from deepening the Norfolk Harbor in-bound channel from 45 to 50 feet. DMA prepared commodity projections, fleet forecasts, developed with and without project conditions, and computed costs, benefits, and benefit-cost ratios. DMA completed the economic analysis under extreme time constraints, performing the entire analysis in two months. DMA’s analysis was approved by the District and Division and allowed the dredging to commence on schedule. DMA, with the assistance of Dial Cordy and Associates (subcontractor), is developing the Project Management Plan to identify the tasks and requirements necessary to develop a Section 203/204 Project for navigation improvements related to the Wilmington Harbor Project. The Project Management Plan began with an initial round of data gathering and review in order to become familiar with prior projects and studies related to Federal navigation projects at the Port and previously proposed improvements. DMA compiled existing data and reviewed the information and analyses to determine relevancy for use for the Wilmington Harbor Section 203 Integrated FS/EIS and identified any data gaps. DMA is currently in the process of developing the preliminary draft PMP which involves the preparation of draft technical planning, economic, engineering, and environtmental tasks descriptions; the preparation of draft task budgets and summary cost estimates, and the preparation of the project schedule and Gantt Chart. Next, DMA will revise the preliminary draft PMP to produce a draft PMP for submission to and coordination with NCSPA and the USACE. Our firm will assist the NCSPA Project Manager in presenting the draft PMP to the USACE to obtain their comments and input on the Section 203 study approach. After the presentation, DMA will prepare the final PMP by revising and updating task descriptions, budgets, and schedule to reflect comments and issues raised at the review meeting. In addition, DMA will prepare an annotated Integrated FS/ EIS outline, a recommended acquisition plan, and draft scopes of services. DMA conducted an economic analysis for deepening the main channel of Boston Harbor to depths in excess of 40 feet. DMA prepared commodity projections for containerized cargo, determined the hinterland for imports and exports, and evaluated the market share of Boston Harbor and the other competitor ports which also serve its hinterlands. A trade forecast has been prepared, projecting containerized cargo imports and exports for the period from 2005 to 2065 A fleet forecast has also been prepared, projecting the number, size and types of vessels expected to serve the port over the 50-year planning horizon. DMA calculated the transportation cost savings associated with a variety of channel improvement scenarios. DMA is in the process of providing consulting, professional engineering, and construction managament services to serve as Broward County's technical advisor in connection with the US Army Corps of Engineers deepening and widening of Port Everglades Harbor and construction of related navigational improvements. The project includes three phases: DMA and subcontractors are currently operating on Phase 2. DMA has concluded Phase 1, the Feasibility Study phase activities. During this phase, DMA attended meetings with the Port, USACE, agencies, and stakeholders to assist the Port in coordination and project advocacy meetings, in preparation of materials, provided input, and acted as a representative of the Port to resolve issues regarding project impacts, evaluation, mitigation, and threatened/endagenered species to finalize the FS and EIS Report. Our firm developed and maintained an indepedent tracking system and schedule, reviewed the Draft Feasibility Report & DEIS, assisted the Port in Project Management Plan preparation, provided environmental support activities, and participated in benefit/cost review and analysis activities. The project is currently in Phase 2, the PED phase activities. DMA is in the process of performing bioloigcal studies and investigations in support of permitting. DMA is also providing interagency coordination and facilitation by participating in Agency and PDT meetings; perparing the public, interagency and stakeholder outreach plan; and will facilitate the revised monitoring plan agency and stakeholder meeting, as well as arrange the summary report. DMA is also providing mitigation planning assistance, conducting the coral survery and preparing the report, performing sediment transport modeling and baseline turbidity/ TSS data collection, and implement project management activities during PED. DMA is contracted to perform project management activities, as well as environmental, engineering, geotechnical, surveying, and mapping activites during Phase 3, the Construction phase. Project management activities include subcontractor management, QC, and schedule management. Environmental activities include the following: pre-construction seagrass survery, pre-construction hardbottom survery, pre-construction sedimentation rate baseline survery monitoring, conducting remote and diver survey of Acropora colonies, and conducting ADCP current and water quality baseline data collection and water quality monitoring. Subcontractor Taylor Engineering will provide daily construction administration and observation services while DMA will perform problem resolution site visits, review and approve of contractor submittals, review and approve of monthly pay applications, project close out, and conduct final review/ acceptance of field data. Geotechnical activites include site inspection, review of hisotrical information, soil and groundwater sampling and analysis, site assessment report, reivew of geotechnical information, initial geotechnical exploration, and data review and preliminary evaluation. Surverying and mapping activites will be performed as determined by Phase 2. DMA conducted an economic analysis of the benefits that would be associated with a new container terminal at Craney Island. Without development of a new facility, the port is likely to reach throughput capacity in the next decade. Expansion of Craney Island eastward would provide the opportunity to build a new container facility to meet this excess demand. DMA is calculating the benefits associated with this new facility by identifying the differences in transportation costs between a new Craney Island facility and the most likely alternative transportation scenarios that shippers would have to employ if Craney Island was not available and traffic had to be diverted to alternative ports. As a part of this investigation, DMA developed commodity projections, fleet forecasts, identifying alternative port options, and calculating both water-side and land-side transportation costs from point of origin to final destination. DMA assisted the District during Corps Headquarters review, resulting in a positive Chief of Engineers Report and authorization by Congress. Multiple tasks were performed by DMA in support of the Jacksonville District to prepare the updated Economics Appendix for the LRR. Tasks included: navigation data collection, model development, computation of without and with project transportation costs, incremental benefits of alternative channel depths, computation of BCR, net benefits, & risk analysis, and preparation of the draft and final economics appendix. DMA conducted feasibility phase investigations of structural and non-structural alternatives to improve anchorage usage in the NY/NJ Harbor complex. DMA activities include: development of a feasibility study quality control plan and preparation of quality control reports; review of existing data; establishing existing conditions; developing a forecasting model; developing without project future conditions; developing alternative plans; performing preliminary screening of alternative plans; developing with project future conditions for selected alternative plans; calculating NED benefits and costs of selected alternative plans; identifying the NED plan and any locally preferred plans; preparing the AFB technical memorandum and associated quality control report; preparing the feasibility report and associated quality control report; and feasibility analysis coordination. DMA performed economic and social analysis investigations in support of the New York and New Jersey Harbor Navigation Feasibility Study. DMA performed three groups of study tasks for Phase I of the economic and social analysis: baseline analyses, projections analyses, and alternatives analyses. The baseline analyses established existing conditions of national and port-specific trade. DMA’s alternatives analyses compared the costs of commodity movements for the with- and without- project conditions, assessed how these costs affect the competitiveness of the port compared to other regional ports, and applied a risk based analysis to estimated project benefits and costs. In the second phase of the project, DMA performed all economic activities necessary to complete the feasibility phase of the project. Analysis of with and without project conditions determined the future use of the harbor in terms of fleet composition, commodity flows, and transportation costs under alternative scenarios. A multi-port analysis was also completed. Next, DMA computed project costs, benefits, benefit-cost ratios, net benefits, and identified the NED plan, including phasing of channel deepening throughout the harbor complex. Finally, DMA prepared the economic appendix and the economic sections of the Feasibility Report and EIS. DMA conducted an analysis to compare actual CY 2000 commodity movements with projections prepared in 1993 during the feasibility phase of the project. DMA analyzed commodity movements by type and origin-destination in order to isolate the differences between actual and projected commodity movements. Once differences were identified, DMA staff evaluated the causes of these disparities by comparing commodity movements through the Port of Baltimore with the North Atlantic Region and the U.S. as a whole. DMA supported the Jacksonville District in conducting the economic analyses required for the Limited Reevaluation Report for the federally authorized navigation project for Crown Bay, USVI. DMA established without-project conditions based on commodity movement projections, forecasted fleet composition, and examined existing operations. DMA calculated the benefits of project implementation as the reductions in total transportation costs due to navigation improvements and estimated potential benefits in one-foot increments up to authorized project depth. DMA supported the Jacksonville District in performing economic analyses required for the general reevaluation report to determine the economic feasibility of improving the existing Hillsboro Inlet channel system. Commercial activity related to Hillsboro Inlet includes a commercial fishing fleet, a sport fishing fleet, a dive excursion fleet, and a gaming vessel that travels to federal waters where gaming is not prohibited. Existing conditions at the inlet and the effects of these conditions on commercial operations were determined through extensive interviews with vessel operators, dredge operators, and local officials. Benefits were estimated to assess the incremental improvements to authorized conditions in order to identify the project depth that maximizes net benefits. DMA staff prepared a Navigation and Recreation Study and assisted in the formulation of a reconnaissance plan for navigation improvements along Reynolds Channel and the New York State Boat Channel. Benefits of improved access and improved safety for the commercial fishing fleet, petroleum transport vessels, party/charter boats, and recreational fishing boats were calculated. Future with and without project conditions and average annual navigation benefits were computed for each fleet based on identified usage of the channel, operations, and expected damages. In addition, DMA staff calculated the average annual costs for operating and maintaining the projects developed in the engineering study and determined the feasibility of Federal takeover of all or portions of Reynolds Channel and the New York State Boat Channel. The product was a positive reconnaissance report recommending further Federal involvement in a feasibility study. For the Virginia Port Authority, DMA is preparing an EIS for the Norfolk Harbor Navigation Channel Deepening as directed by the Council on Environmental Quality NEPA- Implementing Regulations (40 CFR 1500-1508) and USACE Engineering Regulation ER 200-2-2. While this contract is in its early stages, the numerous tasks have been completed including preparation of an internal scoping/ preliminary planning document to summarize the critical assumptions that will frame the draft EIS; formation of agency coordination letters, preparation of a draft NOI in accodrance with the Council on Environmental Quality's NEPA Implementing Regulations (40 CFR 1500-1508) and Engineering Regulation ER 200-2-2; and administrative and technical support for a public scoping meeting. As the project progressess, DMA will be responsible for informal Scoping with the Resource Agencies, preparation of the Draft EIS, which will include Review of Existing Studies, Data, and Documents, and prepration of a Construction Assumptions Appendix, quantification and articulation of the direct and indirect effects of the tentatively selected plan; Quality Assurance Documenation, DEIS Comment Response and Revision; Publication of the DEIS and Public Review; particiaption in Public Hearing, and Review, Categorization, and Reponse to Comments on the DEIS; preparation of the Preliminary Draft and Final Draft Records of Decision; and preparation and transfer of the Administrative Record. For the San Francisco District, DMA prepared a SMMP to guide the placement of dredged material from the maintenance dredging of navigation channels in the San Francisco Bay area over the next 20 years. The Regional DMMP included background information and baseline conditions on various topics including the Bay environment, on sediment transport and shoaling in the region, on dredging and disposal, and on projections of this activity over the next 20+ years. DMA prepared manuscripts that cover affected environment, physiography, geology, climate, air, water and sediment quality, hydrodynamic and sediment transport dynamic, regional sediment management, bay and ocean biological resources, and species of concern as well as invasive species and their pathways. Our firm performed all plan formulation duties, developed a framework for comparing and evaluating alternative plans , and prepared NEPA documentation. Subsequent to a highly critical GAO audit of the economic analysis conducted by the Corps of Engineers, DMA was contracted to prepare an independent economic reanalysis of the economics of the project to deepen the Delaware River main channel from 40 to 45 feet. DMA conducted a full reanalysis of potential benefits to liquid bulk (crude oil, petroleum products), dry bulk, and containerized commodity movements into the Delaware River ports. DMA prepared new commodity projections and fleet forecasts, and identified potential transportation cost savings. DMA also conducted a detailed analysis of the cost of non-Federal ancillary facility improvements (berthing areas, docks, storage) necessary to deliver the project benefits. Because of the extremely high visibility of the project, DMA analyzed shipping movements in excruciating detail, down to the individual vessel, commodity, customer, and liner service level. DMA’s analysis was subject to two independent technical reviews (ITR) by transportation experts in the academic and consulting communities. DMA’s final analysis was accepted by the ITR team, the MSC, and Corps Headquarters.